Family villa with amazing views & full privacy next to the city and the beach! Villa Belle is approved by Greek Tourism Organisation with license number: 1041K91002985601 & managed by "teouri vacation rental management". The unique attributions of villa Belle in our opinion are: - Outstanding panoramic views over the Cretan sea and Rethymno town. - The location, as the villa is situated a few minutes away from the Rethymno town while being next to Atsipopoulo village where you can find everything. It is also an ideal base for those wishing to make excursions as it is close to the national road in the centre of Crete. - Very near to the numerous sandy beaches on the North coast. - Quiet area with no noise from cars or neighbouring houses. - Spacious indoor and outdoor areas both with all kinds of facilities such as pool, hot tub, outdoor playground, indoor playroom and gym. - Many amenities for children: outdoor fenced playground, children swimming pool and indoor playroom area with a variety of facilities such as pool table, table tennis, table football, and Playstation 4 with games. - Fully equipped barbecue with 2 large outdoor dining tables. - Full privacy in any location outdoors. - The hospitality of the owner and his family who will be on hand for advice and information if need be. Holiday advisor call centre is available exclusively to our guests. Each villa has a landline directly connected to our office in which you can call anytime for any question or advice! Air condition in every room and in all areas. Gym area with a collection of fitness equipment such as a treadmill, exercise bike and a fitness multifunctional apparatus. In your arrival you will find coffee, sugar, salt, spices, some basic cleaning stuff, kitchen and toilet paper, bottled water. You can also send us a list and find everything in the house on arrival. We provide you everything in order to cook and serve 12 people! Fully equipped kitchen with branded electric devices. The villa has two dining tables indoor, one in the kitchen and one in the open plan living room area. Also there are two more dining tables outdoors! Playroom area with a pool table, table tennis, table football, 55” HDTV, a Playstation 4 with games, board games, DVD player and DVDs. We provide you board family games and a playstation 4 with games. There are children toys for young children in the villa and a playground outdoors. 4,000 square meters of fenced gardens of which the 2,600 square meters can be used from our guests! One central veranda which connects the living room area with the pool-garden area! 55 m2 pool with sea views. Also one part of the pool is fenced for young children. lower depth: 0.75 m. and maximum depth:1.40 m. The pool can be heated with an extra charge of 40€/day. Hot tub for 6 - 7 people with sea view! Our services include: Welcome Basket - Cleaning every 3 days - Linen and towel change every 3 days - Pool towels provided - Gardener twice a week - Cleaning and pool maintenance 2 or 3 times a week (depends on the weather). Services upon request (extra charge): Doctor on call - Massage - Daily cleaning - Baby sitting - Daily excursions - Bicycle rent - Photographer - Delivery of traditional cretan food to your place - Airport transfer - Cook (Chef) in your villa. Please tell us your wish and we will try to make it reality! Very nice and helpful owners. A fantastic villa! This fantastic villa was just good for our needs. We were three families together. Really comfortable pool area, and the jacuzzi was absolutely the place to spend time together. The kitchen worked well. We have only positive things to say, a really comfortable place to stay. A big thank you to owners! We spent one week in Villa Belle and absolutely enjoyed every minute of it. Right from the start we knew this was going to be special. Our family flown from different parts of the world to gather there in Crete and regardless of where we came from, Australia, England, Canada or Saudi Arabia, we were all impressed by the attention to detail and the 270 degrees views. We saw the sunrise and sunset right from the gardens with a turquoise sea in front. To top it all off, the owners were absolutely amazing and made us feel very welcome. If I go back to Crete, this will be the place I would be staying again. We spent 10 fabulous days at the beautiful Villa Belle and enjoyed ourselves so much that we were all sad to leave. We were a group of 6 (2 families with 2 teenage children). We were met by the villa owners Stelios and Joanna on our arrival, even though our flight was late at night, they were really friendly and welcoming. They had been shopping for us and left us some complimentary drink and food. When we first arrived we were stunned by how spacious and luxurious Villa Belle is (the photos do not do it justice). It is no exaggeration to say that it is breath-taking. Internally the villa is decorated to a high specification and is extremely well equipped. The size of the villa could easily have catered for a larger party. The addition of the games room/gym was a great bonus for us and the kids. We have stayed in a lot of villas and we felt that the outside space and facilities was the best we have encountered so far. The gardens are beautifully landscaped and there are so many seating areas that we struggled to use them all in our 10 days. The swimming pool was a good size and was perfect for cooling off on hot days. The Jacuzzi added to the luxury feel of our stay. 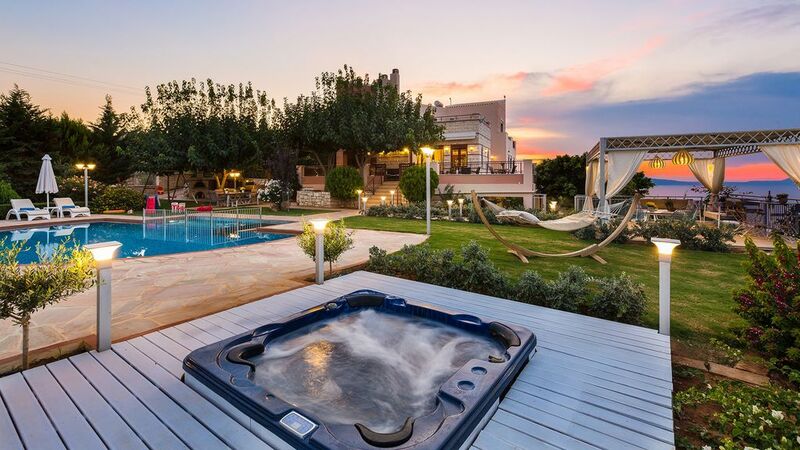 It was so fantastic to sit in the Jacuzzi and admire the view of Rethymno day and night. Stelios attended the gardens and pool on a daily basis to make sure it was perfect for our use. He came early in the morning and his attendance never felt intrusive. Joanna and Kostas the villa manager were available by WhatsApp and text us to make sure we were having a lovely holiday. Kostas was very helpful with the arrangements for our car hire. The local village has good amenities with a bakery, shops, tavernas and even a Lidl. The villa is very well located being in the centre of the island. It only took 10 minutes to get to Rethymno by car which was brilliant. The national road was nearby allowing easy access to other areas of Crete, but far enough away from the villa to prevent any noise. We all loved our stay and we look forward to visiting again soon. What a wonderful stay we had at Villa Belle, could not fault anything about the villa at all. The owners are fantastic and offer such a wonderful personal service and nothing was too much trouble! The outside area is just fantastic and we wish we had been able to stay longer! The villa is located just next to the village “Atsipopoulo”, a well known village which has flourished in the last 10 years and now is actually a small town in itself and a suburb of Rethymno. With an abundance of amenities Atsipopoulo nowadays has all kinds of shops, supermarkets, bakeries, restaurants and services. The villa's positioning is ideal for people who relish a quiet place to relax but wish to be close to everything. Furthermore it is a great base for making excursions around Crete as the main national road is only 2 minutes away. PLEASE be advised that the villa may appear on a different 'location category' on HomeAway affiliate websites, depending on their categorised locations (each affiliate website has its own 'location categories'). *Special Offers 2019 are Now Available* Everything is included in the price! There are no additional charges in the price! The swimming pool can also be heated with an additional charge of 40€/day. Payment Schedule The deposit needed in order to secure the booking is the 25% of the total cost of the reservation. The remaining balance is due to be paid 21 days prior to the guest’s arrival.